Ca. 1000 BC - The Ohlone Indians occupied the Monterey Bay area. 1542 - Cabrillo sailed by our coast. 1578-79 - Sir Francis Drake sailed by our coast. 1602 - Sebastian Vizcaino discovers Monterey Bay as a port for the Manila galleons. 1600-1700 - Chinese sailing ships are reported. 1769 - Gaspar De Portola, together with Father Crespi, leads the first overland expedition through the county October 8-22, and although they discovered signs of the native peoples, they never actually saw the "heathen". 1774 - The second Governor General of California, Capitan Don Fernando Javier De Rivera Y Moncada, together with Father Palou, passed down the coast from San Francisco to Carmel and on December 11th, discovered the Aptos Indian village of eleven huts above the river. 1791 - Mission “Exaltacion de la Santa Cruz” (Holy Cross) was started by Father Lasuen and completed in 1794. This was the twelfth mission founded in Alta California. The name "Aptos" is first recorded in baptismal records of the Santa Cruz Mission as a local Native American name for our area. 1803 - Rafael Castro was born at Villa de Branciforte. 1831 - The mission was secularized and Rafael Castro was provisionally granted 5500 acres as Aptos Rancho from Mexican Governor Manuel Victoria. 1833 - The Aptos Rancho was confirmed by Mexican Governor Jose Figueroa; Castro builds his house at the confluence of Aptos and Valencia Creeks. 1840 - The Aptos Rancho was increased to 6,685.9 acres by Governor Juan Bautista Alvarado. Flood waters filled Castro’s house. He moved to the top of the knoll overlooking the creeks. 1848 - California annexed to United States as a territory. 1850's - Castro builds Aptos wharf (Aptos Wharf Road). 1851 - Saw mill built on Aptos Creek near town, by a group of Frenchmen, probably Francisco Allemari, A. Placio and Louis Christoff. 1853 - Tannery built on Porter Gulch, now the Apple Lane Inn. 1854 - Castro converts French sawmill into the Cascade Grist Mill. 1860 - Jose Arano builds first General Store with a residence above, at the corner of today’s Soquel Drive & Aptos Wharf Road, which connected to Castro's wharf at the beach. 1860 - Judge Ben Nichols builds a lumber mill in Aptos; First bridge built over Aptos Creek. 1868 - Aptos Bridge destroyed in an attempt to stop Small Pox epidemic from Watsonville; Mount Carmel / Calvary Cemetery was laid out on land donated by Castro. 1869 - Live Oak House built by Patrick Walsh. 1870 - Arano's General Store becomes first Post Office; Frederick A. Hihn builds Sawmill on Valencia Creek. Output 70,000 - 143,000 board feet/day. 1871 - First school built where Sushi on the Run is today, 7957 Soquel Dr; Aptos Mineral Spring becomes famous. 1872 - Claus Spreckels buys 2,390 acres east of creek for summer home. (+200 more in 6 months @ $30/acre). 1874 - Spreckels builds Deer Park with 12 foot fence to hold wild game. Also a sulky race track. 1875 - Chinese fishing camp established at China Beach (New Brighton) 29 fishermen; Catholic Church built; Aptos Hotel built by Spreckels on site of former Indian Village. Spreckels Drive was the private entrance drive. June, 6th, three trains from Santa Cruz bring over 1,000 people, plus another 500 by private conveyance, to the dedication picnic for Spreckels' Aptos hotel. 1876 - Cypress trees planted around cemetery and down Santa Cruz Watsonville Road (Soquel Dr.) May 7th	Opening Day of the Santa Cruz Railroad. First train runs through Santa Cruz County. “Betsy Jane” and "Pacific" left opposite ends of the county and met in Aptos. Narrow gauge railroad promoted and partially financed by Hihn and Spreckels. "Jupiter" (first engine) is now in the Smithsonian. 1878 - "Anchor House", (Bayview Hotel), built by Joseph (Jose) Arano; China Beach fishermen shipped 177,000 lbs. of fish on the train; Camp San Jose visitor campground opened on the bluff at New Brighton Beach forcing the Chinese fisherman to move down the coast toward Aptos. 1881 - King David Kalakaua of Hawaii visits Spreckels (October 18th); Southern Pacific buys Santa Cruz Railroad and begins laying standard gauge track. 1882 - Loma Prieta saw mill built in Aptos Canyon including post office, express office, stores, cabins and a hotel. The town grows to 185 residents and the mill is expanded to produce 140,000 board feet per day at full production. 1883 - Southern Pacific completes laying standard gauge track and builds spur line into Aptos Canyon using 225 Chinese laborers; May 23, Frederick A. Hihn’s Aptos Mill opened on Trout Gulch Creek, just above its junction with Valencia Creek. It was capable of producing between 30-to-40-thousand board-feet of lumber per day. The mill was moved to Valencia in 1885; Bay View Hotel adds fourth floor? 1883-1923 - Logging era produces 140 million board feet of lumber. Aptos expands to 3 hotels, 13 saloons, a deep sea pier, 2 railroad stations and 5 railroad spur lines. Aptos Creek was dammed to float lumber and Valencia Creek was the town’s water supply. 1886 - Spreckels forced out of Hawaii. 1888 - Spreckels opens the largest beet sugar factory in North America in Watsonville. 1888 - Mangels House built by Claus Mangles, brother-in-law to Claus Spreckels. The house is virtually a copy of the Spreckels mansion. 1889 - Aptos pier destroyed by storm. 1890 - Hihn Apple Packing Plant built behind Bayview Hotel. (Village Fair Antiques). 1893 - Aptos Township formed. 1896-97 - Spreckels tore down the Aptos Hotel and used materials to build the town of Spreckels near Salinas. He also moved several whole buildings from Aptos to Spreckels. He also moved his sugar factory to that location. 1896-1904 - John J. Montgomery visited the ranch of Thomas, John and James Leonard, between Aptos and Manresa Beach. He experimented with model gliders off the railroad trestle. He also developed a gold separator which the Leonards used to extract gold from the beach and later financed the construction of the building in Aptos Village in which Café Sparrow now resides. 1898 - Sugar factory closed in Watsonville. 1899 - James Leonard builds Aptos General Store with money from La Selva Beach gold mine. Post Office moved to new store with Tom Leonard postmaster; Second Aptos School built by Spreckels (World Savings location). 1900 - Hundreds of Native Americans still camped on the beach and were employed cutting firewood and working in fields and orchards. 1904 - Montgomery hired and trained aeronaut, Daniel John Maloney to handle the two full scale glider “aeroplanes” completed in the autumn of 1903. 1905 - Montgomery directed Maloney in a balloon lift of the glider to heights of 800 to 3000 feet. The balloon was rented by Fred Swanton (the builder of the Santa Cruz Casino, later the Boardwalk). Maloney cut loose and maneuvered over an area of two miles in the air, banking, rising, turning at ease and landing safely on successful flights of March 16th, 17th, and 20th, at Leonard's ranch, Aptos, California, (now Seascape). These were the first high altitude Aircraft flights in history. 1905 - Lam Pon/Ralph Mattison (L & M) apple dryer built in downtown Aptos. 1906 - San Francisco earthquake. 1911 - The Porter Sesnon family built a grand summer home called "Pino Alta”. The home and landscape costs exceeded $60,000. The home is now called "Sesnon House" and is part of Cabrillo College; First telephone service. 1919	January, Aptos Township consolidated into Watsonville Township; The movie "One Way Trail" was filmed at the Loma Prieta Lumber Mill. 1920 - Castro House burns; Rio Del Mar Beach becomes notorious unloading point for bootleg liquor; July 5th The San Christina Investment Co., formed in 1909 to administer the trust of the 1922 Spreckels Estate, sold 2,390 acres to Fred Somers of Pomona for $87.45/acre who then pre-sold land at $216/acre to finance the purchase. 1924 - Forest Glen development opens above Aptos Village. 1925 - Monroe-Lyon-Miller of Los Altos took over the property at $400/acre; Seacliff Company begins development. Over $100,000 in lots are sold. Seacliff is unable to persuade Paul Woodside to sell his cliff-side property. Ultimately the Sheriff is called to the property. A shootout ensues. Woodside, Sheriff Trafton and Under Sheriff Roundtree all die. 1926 - Golf Lodge and Course built. Designed by Willie Locke, inventor of the nine iron. Aptos Creek estuary (Rio Flats) is leveled and raised seven feet. Rio Del Mar name is coined. 1927 - Aptos Chamber of Commerce founded June 20; Seabreeze Building constructed by A. A. Liederbach. 1928 - Redwood Village built by Raymond Parker on the former site of Spreckels’ stables. The redwood grove was thinned and the timber milled to construct cottages for vacationers. (In 1974 it was converted to shops. ); Third grammar school (Valencia) built on land donated by Monroe, Lyon and Miller; Concrete dam built on Aptos Creek to create world's largest fresh water swimming pool, with abathing pavilion. 1929 - Spreckels Mansion burned; Aptos Creek Bridge opened May 17; Monte Toyon deeded to Methodists; Rio Del Mar Country Club Inn built. Opened May 1. 1931 - Seacliff was established as one of the first California State Beach units. Bathing pavilion torn down between 1931-35. 1933 - Deer Park Tavern built by N.J. (Shorty) Butriza, a Yugoslavian. The Tyrolean style building was originally decorated with hunting trophies and music was supplied by a Hammond organ built for the place. The widening of Highway One in 1947 forced Shorty to move it up the hill to its current location. 1935 - Catholic church closed. 1941 - Rio Del Mar Improvement Association founded; Peter and Olaf Harken spent the war years with Mr. and Mrs. Martin Jonguneel. The Harkens went on to found a major boating supply company. 1945 - About this time the last two remaining Aptos Native Americans had a heated argument and one slew the other. The remaining Native American, Jimmie, worked on the Hihn Ranch and died about 1951. 1946 - Bayview Hotel moved to current location. 1947 - Beach Club closed. 1948 - Highway One built; Deer Park Tavern moved to present location. 1955 - State of California adds Rio Del Mar Beach to Seacliff State Beach. Beach Club was demolished. All that remained was a comfort station. 1956 - Aptos Golf Course rebuilt. 1959 - Cabrillo Community College opens in temporary location at Watsonville High School. The permanent site was required to be equal distance between Santa Cruz and Watsonville. 1961 - Aptos Ladies' Tuesday Evening Society formed to defeat a cement batching plant planned for Aptos Village. Southern Pacific tried to block off entrance to Bayview Hotel. Aptos Ladies' Tuesday Evening Society overcame SP. "World's Shortest Parade" inaugurated. 1962 - Cabrillo College Aptos Campus opens; Nisene Marks State Park dedicated; Resurrection Church built; Rancho Del Mar Shopping Center built. 1963 - Aptos Beach Inn burns 3/17/63; Aptos Seascape Corporation of San Diego, buys Krag Ranch 5/63; 500 acres. Was to add 9 holes to golf course. 1966 - Beach Club comfort station removed. 1967 - Rio Del Mar interchange added to freeway. 1969 - Aptos High School built. 1976 - Railroad Centennial Celebration held in Aptos, May 7. 1989 - Loma Prieta Earthquake 7.1, October 17. 2001 - Concrete ship permanently closed to public. 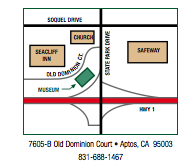 2006 - Aptos History Museum officially opens on May 24, from collections begun in 1985. Major industries have been: Leather hides; Cattle; Vegetables; Wheat and Flour till 1880; Redwood Lumber; Hazelwood for barrel hoops; Tan Oak for the tanneries; Dairy Products; Apples; Tourism; Education.